Oceania represents a geographic region many people are unfamiliar with, composed of Australasia, Melanesia, Micronesia, and Polynesia. Spanning the eastern and western hemispheres, Oceania covers an area of 3.3 million square miles and has a population of 40 million. It’s also home to some of the United States’ valued strategic partners—Australia and New Zealand, with whom the U.S. has aligned for more than a century, and many Pacific island nations. 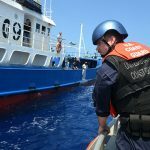 The importance of the Pacific Islands is very evident as the U.S. Coast Guard continues operations in the region and the U.S. strengthens partnerships with the governments of these nations. Tourism and exports, both requiring a great deal of commercial vessel traffic, are the primary economic driver. One of these exports—tuna—represented a nearly $5 billion industry in 2015, with more than half the world’s tuna sourced from the Western Pacific. In 2017 reported landings were 2.5 million tons of fish. How does any country, especially those that are smaller, protect a highly migratory resource in a region of more than 3.3 million square miles? Partnerships. 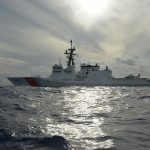 That partnership takes several forms, but most recently it was the crew of the Coast Guard cutter Munro, as they prepared to launch their 35-foot cutter for fisheries law enforcement boardings in the high seas off Fiji in December. The Munro is the Coast Guard’s newest fully operational national security cutter. 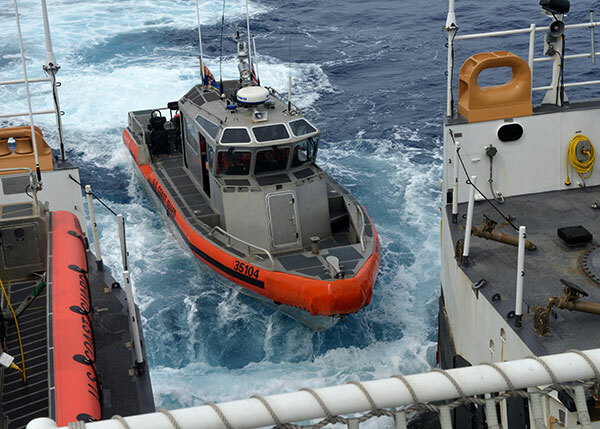 Known as the Legend-class, NSCs are designed to be the flagships of the Coast Guard’s fleet, capable of executing the most challenging national security missions, including support to U.S. combatant commanders. At 418 feet in length and 4,600 long tons in displacement with a range of 12,000 nautical miles, an endurance of up to 90 days they are formidable assets. These new cutters are replacing the aging High Endurance Hamilton-class cutters (378 feet) that have been in service since the 1960s. This patrol marked the first use of this type of asset in Oceania. The Munro crew enforced conservation and management measures established by the Western and Central Pacific Fisheries Commission. This body represents another essential partnership. The WCPFC is an international body made up of 43 nations and international organizations. Members agree to allow the 13-enforcer nations in the pact to board and record any potential violations on their nationally-flagged vessels. The findings go to the WCPFC who notifies the vessel’s flag state of the suspected infraction for further investigation and subsequent action. Participating in the WCPFC ties into a broader strategy the Coast Guard is pursuing in the Indo-Pacific region. Throughout the area, the U.S., and by extension the Coast Guard, is encouraging relationships respecting the sovereignty, supporting fair and reciprocal trade, and the rule of law in an open and free Oceania. Through a tactical lens, that strategy looks like a Coast Guard boarding of a foreign fishing vessel, while on the high seas or in a sovereign exclusive economic zone jointly with a member of that country’s enforcement team. These boardings were off Fiji, a destination perhaps best known for picturesque beaches, incredible sea life, and romantic sunsets. The island nation is part of Melanesia and is an archipelago of more than 330 islands, about 110 of which are inhabited. Endowed with forest, mineral, and fish resources, Fiji is one of the most developed of the Pacific island economies. Tourism and sugar cane represent a large section of the gross domestic product, but fishing is also a large piece. Once a colony of Britain, it is now a republic with a sovereign government. In November the government entered into a bilateral enforcement agreement with the United States providing for shared policing of the EEZ and high seas offshore. That’s what it looks like on paper; in practice it looks like the cutter boat crew launching from the stern of the Munro, with an Air Station Barbers Point MH-65 Dolphin helicopter crew deploying from the cutter’s flight deck to provide support for the operation. The aircrew boarded the cutter in Honolulu to participate in the patrol. Aviation assets further enhance the range of the crew. 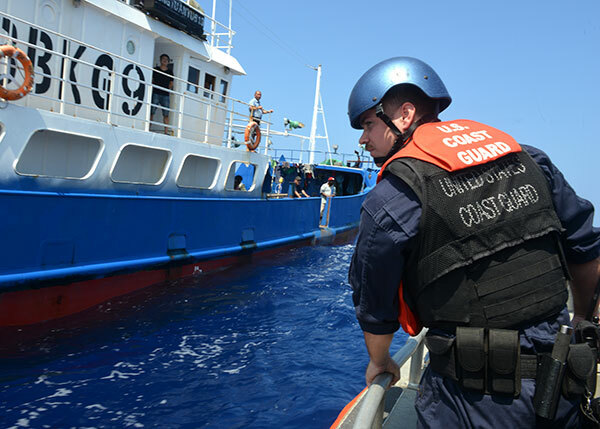 A Coast Guard HC-130, with an embarked enforcement officer from Fiji was also used toward the end of the patrol to identify vessels and enhance the capability and understanding of both sides. In 2009 the Department of State entered into bilateral shiprider agreements with five nations to allow their authorities to enforce fishery laws from U.S. assets in their territorial waters. The number of countries that participate in such agreements with the U.S. has since increased to 10 nations with Fiji being the 11th. Upon arriving in Fiji, the cutter embarked Fijian navy Sub-Lt. Opeti Enesi, a navigation officer, to participate in the first Fijian shiprider on a Coast Guard asset. The following day Enesi joined an Air Station Barbers Point HC-130 Hercules aircrew during a joint law enforcement exercise with a Fijian navy patrol boat. 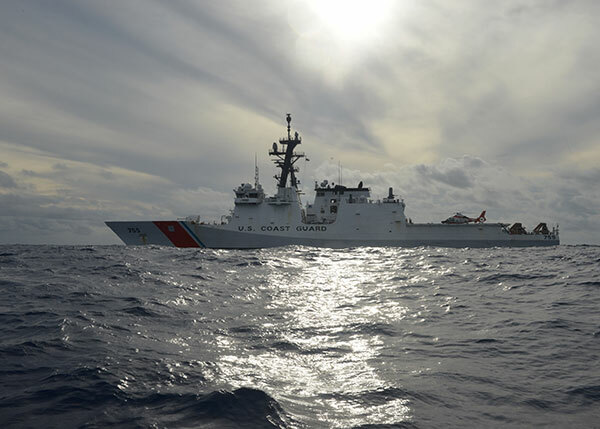 The deployment of the Munro and Hercules crews displayed the Coast Guard’s capability to conduct operations and intelligence, surveillance and reconnaissance across Oceania. These efforts tied directly into the Coast Guard’s goal of conducting operational activities by combining Coast Guard operational presence and information actions with coordinated efforts from our partners to deliver a free and open Indo-Pacific. Through such teamwork, the U.S. and nations like Fiji can work together to ensure a brighter future.